Passion is essential to leading and living a fulfilling life. For me, there is nothing I put my hand to that I am more passionate about than art. I love painting. I am a completely untrained, self-taught painter but I have made it my full intention to learn as much as I can about the art of painting and to grow as a painter. My most recent work represents a departure from my most recent season of kind of strict pen and ink and watercolor geometric abstract pieces. I embrace this as moving into a season of growth as an artist/painter. I would say I have experienced this transition numerous times since setting out to paint in 2013. 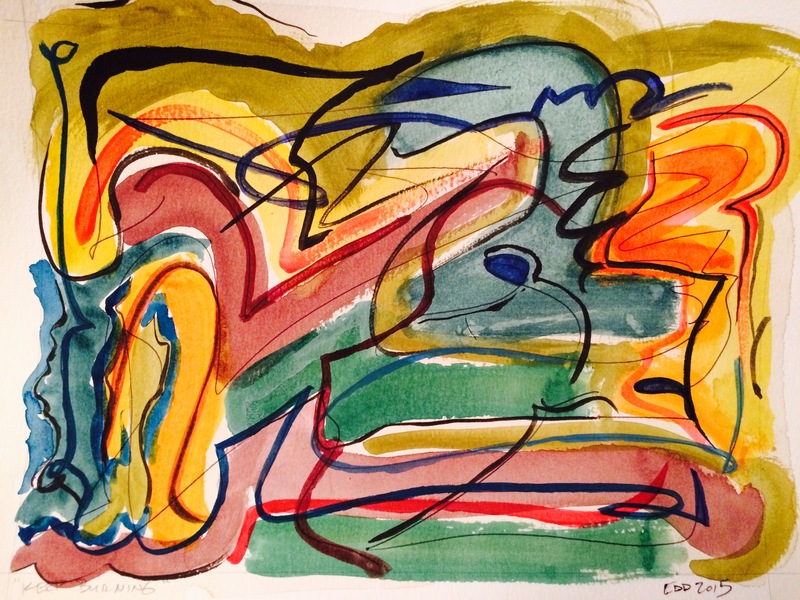 This painting seeks to incorporate a bold, even unorthodox use of color, and the playfulness of line, against a backdrop of unconventional shapes that emerged onto the page rather than being there as the result of careful placement and planning. I dropped in via Hollis’s blog. I like that you are self taught. Your work appeals to me, the vibrancy and your honesty regarding your inspirations. I believe that creativity comes from within – techniques can be taught and creativity harnessed. Thanks for dropping by my site and the follow. I’ll do the same! Jenny I very much appreciate your taking time to come by my site. Thanks for sharing your feedback about my work, it is my great privilege to hear how my work connects with people who appreciate it! I think your site is great & look forward to reading more of your entries. Your writing style is very engaging. Thanks again for your comment & recent visit to my site. We both apart of each other’s blogging universe now and I’m grateful for that. What a wonderful idea thank you so much I will take your advice and start posting there! I’m self taught too, and it’s amazing how much you can learn and how encouraging people are. When you do it let me know and I’ll follow you! Thanks for all your encouragement too! Its so cool to have this global community of artists who mutually encourage & inspire one another. Grateful!